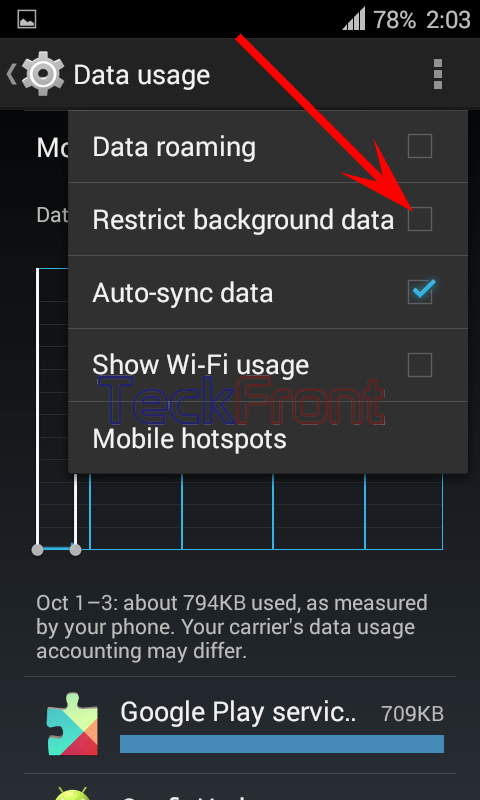 How to Restrict Background Data in Android 4.4.4 KitKat Device? Apps in Android 4.4.4 KitKat devices required continuous update and this process of updating continues without coming in your notice. It is a regular and automatic process of updates in apps but it may consume a lot of Internet usage and one day you may be informed by your ISP provider that you have reached the ending limit. On the other hand, if you are using metered Internet connection, the huge bill of Internet may be on the door steps at the end of the month. So, it is better to control the data usage which is required for the automatic update of the apps. You may restrict the background data by a simple process. For the purpose, follow the instructions. Command Line: Settings > Data usage – WIRELESS & NETWORKS – Settings Button. 1: Follow the Command Line to open up the ‘Data usage’ screen under the WIRELESS & NETWORKS. 2: Tap the ‘Settings’ button at the right corner of the screen, immediately below the status bar. It will open up a popup menu. 3: In the popup menu, see the ‘Restrict background data’ is not checked, i.e. disabled. It means your Android phone is set to download the app updating data to update the apps, automatically, without your approval. 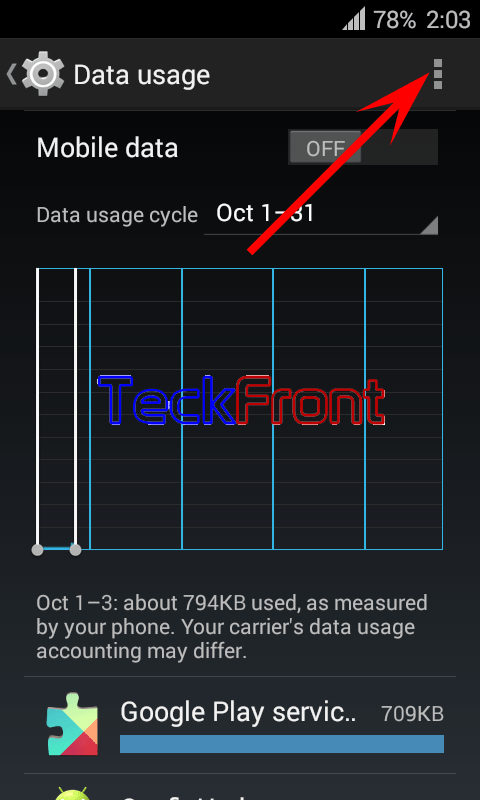 4: Tap to check ‘Restrict background data’ to enable it. It will open up a prompt, warning you that if you restrict background mobile data, some of the apps and services won’t work unless you are connected to a Wi-Fi network. 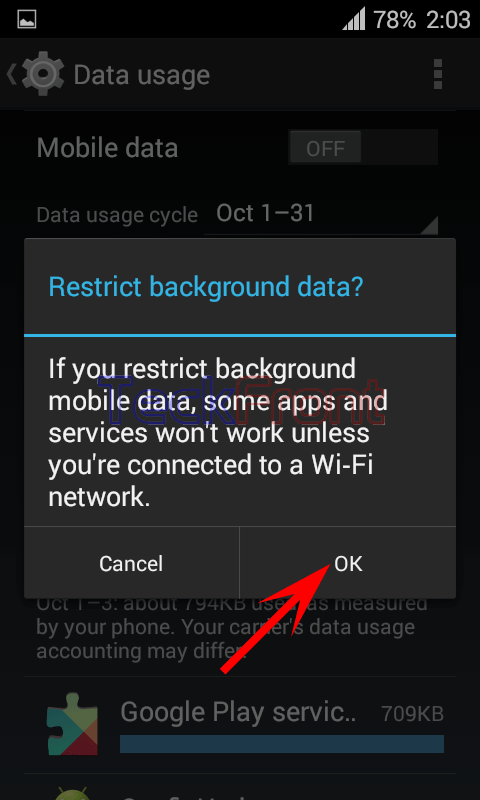 5: Tap ‘OK’ to restrict background data. From now-on-ward, your Android device will be updated only when you are connected to the Wi-Fi. Newer How to Enable Location of Camera Snaps Taken with Android 4.4.4 KitKat Device? Older How to Disable Facebook Notifications in Android 4.4.4 KitKat Device? How to Change Background Color of Windows Form in Visual Studio 15?